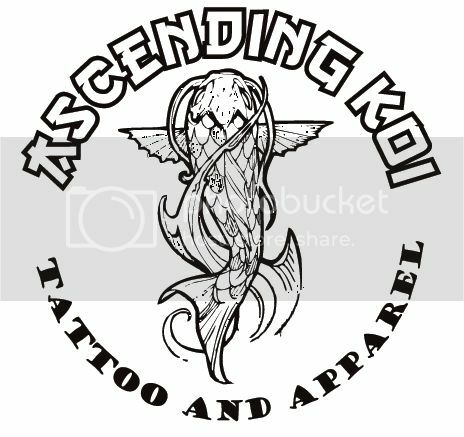 Ascending Koi Tattoo & Apparel is a new shop bringing a new feel to the tattoo industry. We like to think of our space as an art sanctuary. A safe, calm, soothing, experiential place. To be recognized as an example/leader in the body modification industry as THE shop to be a part of…either as a team/family member or as extended family/client. To expand & develop the AK clothing label to further carry our spirit of art & inspiration & positive, thought provoking messages and imagery into the community. To reclaim the original meaning of Tattoo as a rite of passage & combine that philosophy with our desire to promote & support social awareness, acceptance & tolerance & carry that forward into the future. To develop and support healthy relationships & empower people to their reach their dreams, goals & greatest potential. To providing a safe & welcoming environment, designed to attract artists & staff to provide you with a transformational tattoo experience. To inspire & create beautiful art & continued relationships with our clients & community. To show & pursue our commitment to bettering/ participating in local and global community by contributing information, education, inspiration & continuation of progressive thinking and active participation in this, which is our passion. Our personal passions encompass art, the desire to become further inspired & to instill inspiration in others; to engage people in learning about sustainable living & building community that includes all and is exclusive to none. To create an atmosphere of involvement for our clients by engaging & encouraging the client to participate in the development process of their tattoo. To create an environment that supports critical thinking, conscious awareness, personal and community accountability & inspiration for a more fulfilling life. To continue to gift our clients & community with a creative and thoughtful mindset in everything we pursue. To adhere to the highest standard of sterilization practices as set out by the CHA & work to institute even higher standards thereby adding to a deeper sense of security and confidence in our clients.